Kate Tales Foundation holds talk on mental health tomorrow. 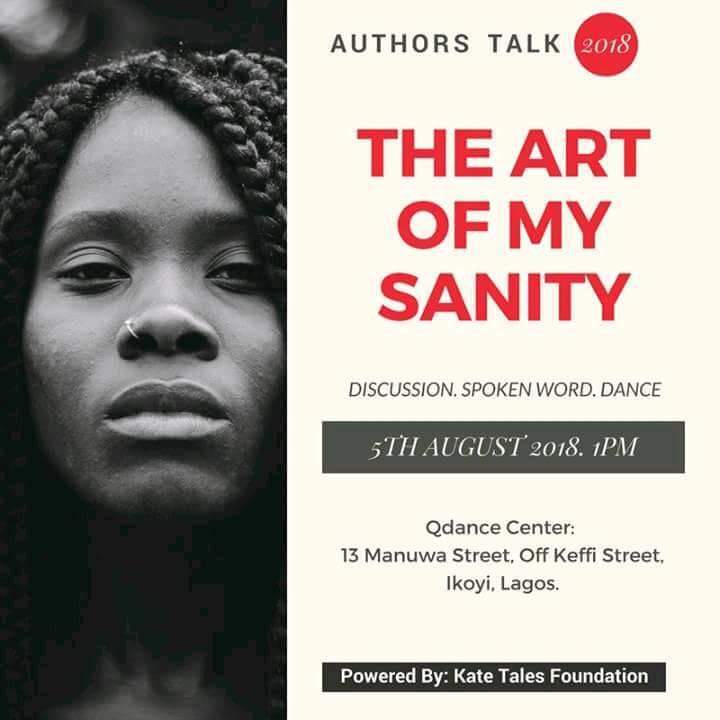 Tomorrow afternoon, 4th August, 2018, performing poets and speakers will gather at the Q-Dance Centre, 13 Manuwa Street, Off Keffi Street, Ikoyi Lagos, for the 2018 edition of ‘Author’s Talk’. 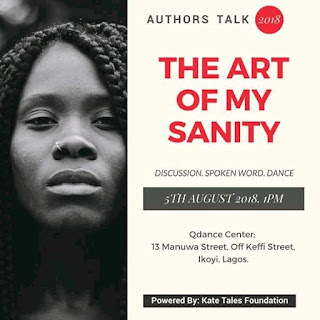 An initiative of the Kate Tales Foundation in collaboration with Q-Dance Centre, the event would feature Spoken word, Discussions, Open Mic and Dance. Themed “The Art of Sanity”, this year's Author's Talk is focused around mental health which organizers say they hope would encourage people to show their real moods without putting on a deceptive happy face by accepting that “the world isn't perfect” and “we're all broken lot, seeking healing”. The panel of discussants, to be moderated by a Legal Practitioner, Social Justice Advocate, Enwongo Christopher Cleopas, would comprise of Ekaete George, Uzoma Ihejirika, Edwina Amakievi Aleme, Joshua Omena, and Efe Paul Azino. Others discussants are Chinwendu Queenette Nwangwa, Deoye Falade, Tochi Eze, Tolu Daniel, Vivian Ogbonna, Mark Anthony Osuchukwu, Roy Udeh-Ubaka, Munachim Amah, Sally Kenneth Dadzie and Iwundu Wisdom. Poets listed to perform at the ‘Authors’ Talk’ include, Efe Paul Azino, Paul Word, Amu Nnadi, Abigail Aliu, Matthew Blaise and Neofloetry.